Here's a great space-saving idea for anyone living in a small home with multiple floors who also happen to be incredibly sure-footed. Mieke Meijer's designed this completely unorthodox staircase called the Object Élevé for a home in the Netherlands to maximize space, functionality, and wow factor. The base of the stairs feature an integrated desk with multiple levels for laptops, printers, and it even has built-in storage. 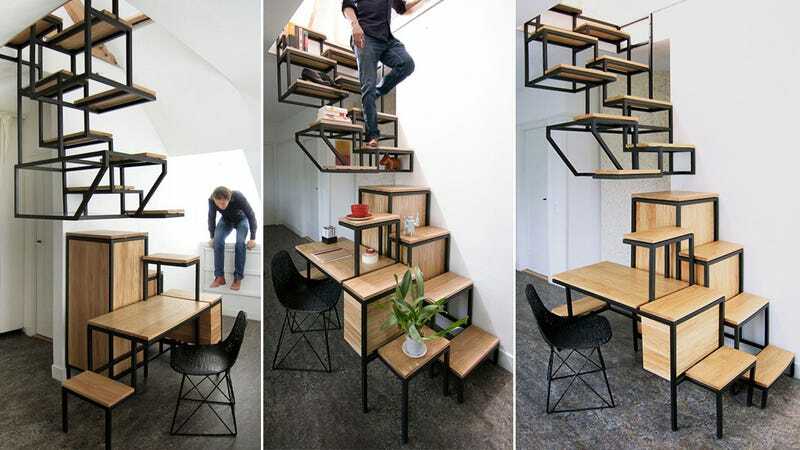 But what's most striking about this staircase design, besides the uneven steps featuring additional storage underfoot, is the fact that the top and bottom are completely disconnected.